One Nation Rally: The Red, “Purple”, and Blue? While glimpsing at all of the tweets concerning the One Nation Rally in DC today there was one that caught my eye. This picture truly encapsulates Nancy Pelosi’s favorite term to describe the Tea Party: “astroturf.”… only it is not the tea party, it is the Progressive left. So what do you see? I see a living embodiment of “astroturf.” I see red shirts, blue shirts, and purple shirts: a plethora of the Progressive minions bused in by their unions, whether by force or no I would gather it was not on their own dime. Update: This is the best Obama could do with all those government workers and union members at his disposal? Even MSM Doesn’t Buy ‘One Nation’ Claim that 10/2 Rally Attendance Topped Beck’s – In reality Al Sharpton already conceded that their numbers were low on Geraldo’s show right after the One Nation event. in the U.S. capital on Saturday as liberal groups attempted to energize their base a month before pivotal congressional elections. The rally, held under sunny skies, was billed as “One Nation Working Together” and followed a large rally by conservatives at the same site just over a month earlier. 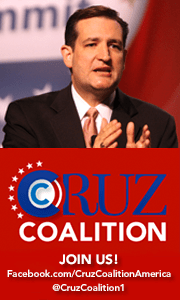 Republicans are trying to regain control of Congress from President Barack Obama’s Democrats in the November 2 congressional elections. The rally was sponsored by unions, civil rights groups and liberal activists whohave been struggling to get their messages heard during an election campaign in which media coverage has focused on voter anger over unemployment, a weak economy and government deficits. 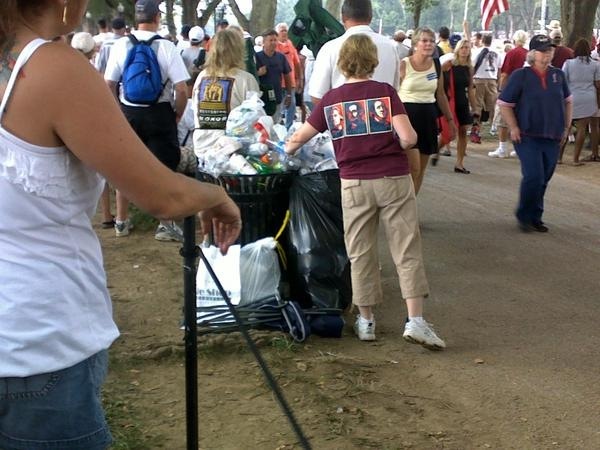 Proud Communists and Socialists March for Obama on Mall . 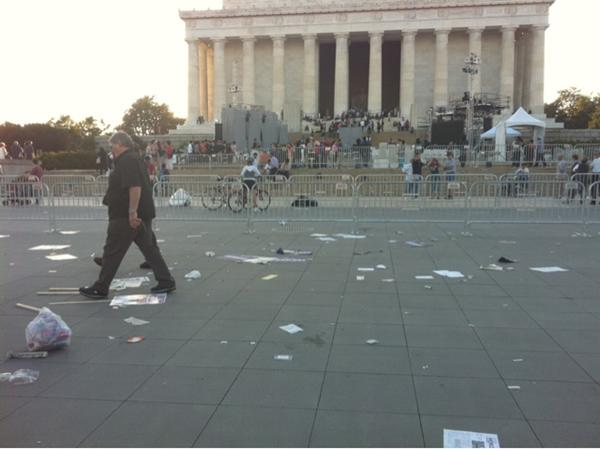 . .
Now compare all the trash left at Obama’s rally to how clean the Tea Partiers left the mall after the Beck rally . . .
Beck asked people to leave their signs at home and bring their kids instead… most did. Beck’s crowd also left the site cleaner than when they came… and Beck’s speakers, including MLK’s niece, spoke of love, God and true unity of all people in America. Here’s your compare-and-contrast photo on crowd size for the Beck rally on Aug 28 verses the Obama rally on Oct 2 . . .
Hat Tip to Ben Hart for update photos and info! ONWT Rally… a Project of the Tides Center – Who Will Be (WAS) There? And still to come is the “joke” rally ‘Americans in Favor of a Return to Sanity,’ on 10.30.10 hosted by Jon Stewart that embarrassingly our President has endorsed. What conservative and independents need to do is turn these pictures and numbers into a battle cry and motivation for Patriotic Americans, Americans concerned with their children’s and grandchildren’s futures, believers in the Constitution and God, and everyday people who use common sense… to turn the obvious (above) into votes and a victory in the next two elections and turn this big Ship… the America based on individual freedoms, inalienable rights and divine destiny around. The biggest mistake that independents or conservatives can make is to assume that they are ahead or will definitely win on November 2nd 2010 or in 2010 without continuing to work and without working to get out the vote!